Blessed with a voice that is both smoky and sweet, Lauren Daigle has forged a unique sound that combines the soulful, heart-in-throat vulnerability of Adele, with the passionate fire to serve God that Daigle admires in Brooke Fraser. Her Centricity Music debut, How Can It Be, is ripe with the kind of compelling lyrics and engaging melodies that invite listeners to draw closer to their creator, and that's just what Lauren Daigle had in mind. In a short time, Lauren Daigle has made an impressive mark on the Christian music scene, she will be touring with Casting Crowns later this autumn and some dates on Chris Tomlin's Adore Christmas tour as she sings on 2 songs from Chris's new Christmas CD: Adore. She will be featured on the Outcry Tour this summer with Hillsong United, Passion and many others. She sang background vocals on Jason Gray's #1 single "Nothing Is Wasted." She sang with Hillsong at a mega church in Birmingham, an experience she'll always treasure, and leads worship two or three Sundays a month at Atlanta's North Point Community Church, pastored by Andy Stanley. 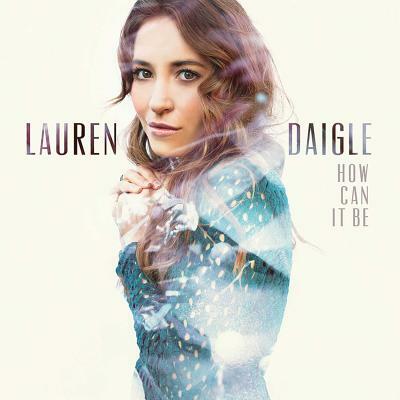 How Can It Be CD by Lauren Daigle was published by Integrity in November 2015 and is our 59th best seller. The ISBN for How Can It Be CD is 0829619128024. This cd was given to my 10 year old daughter by her godmother- my daughter loves it - and I loved it so much I "borrowed it" on a long term basis! So I have now bought 3 more, to replace the one I borrowed and as gifts. This album is a great mix of uplifting anthemic songs and quieter soulful melodies. I use it as driving music and find it really encouraging. Got a question? No problem! Just click here to ask us about How Can It Be CD. Now Playing: First Your browser does not support the audio element.